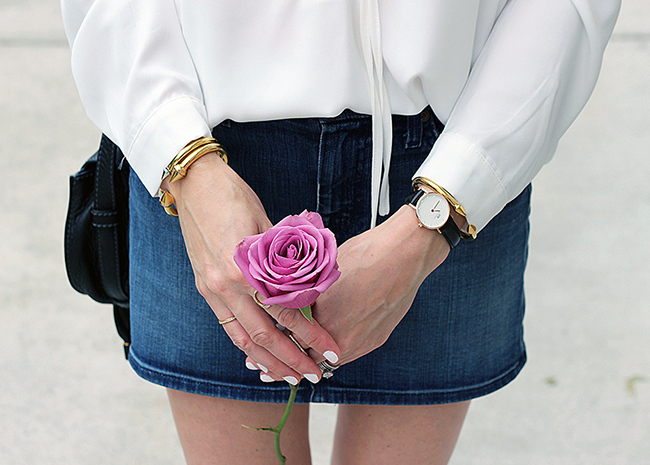 When was the last time that you wore a denim skirt? I have to admit, for me it had been a while. I'm not sure why I hadn't pulled the denim staple out of my closet in quite some time, but as of recent, I can't stop wearing mine. Denim skirts are the perfect item to throw on during a hot summer day, and look great with just about everything. Tanks, blouses, heels, bathing suits, sneakers, flip flops, anything is pretty much a go. Plus they make a perfect fall staple, and I can't wait to pair mine with a chunky sweater and booties. The denim skirt I'm wearing is by 7 For All Mankind. I've had it for years, but because of it's classic cut it, it will always be in style. This exact skirt is no longer available, but I love this similar option from Express. Because my skirt is quite mini, I'm thinking that a slightly longer length would be better for chasing around the twins, and have my eye on this AG skirt. I also love the idea of adding a fun twist to the classic, such as a button front, a fun bow, or a fringe hem. For this #OOTD I decided to pair my denim skirt with my lace up blouse and flats. The lace up trend will still be strong for the fall, and I can't rave more about the fit of this blouse. I'm also obsessed with the blush color of my flats, and will be wearing them with everything this fall. Do you all like my new Karen Walker sunglasses? Guess what, they're rented! Yes, you heard me right. Ditto, an online eye wear retailer, offers a subscription program called Endless Eye Wear, where you can rent designer sunglasses (or eyeglasses if you choose). You simply pick the pair of sunglasses you wish to wear, keep them as long as you would like, and when you're ready, swap them out for a new pair. A new pair of Prada's every two weeks? Yes please! The best part is all the great brands they carry: Karen Walker (my personal favorite), Prada, Illesteva, Burberry, and Ray Ban just to name a few. The service is $24 a month, but you can try your first month free by entering my code: THREADSFORTHOMAS at checkout. You're welcome! Love this! I need to get my denim mini out!! Love this outfit!! The denim skirt is so cute!! You look fab! I love the lace up top with the lace up flats! And yes your sunnies are awesome! And so cool they're rented! So good! Love this whole look and def something I would wear for sure. I love the skirt! Flawless look, babe! That blouse is gorgeous! I love the lace up and it looks so cute paired with the denim skirt! This outfit is absolutely adorable, love it. I wish someone in Australia will start a business where you can hire sunnies. I just post Denim skirt and white blouse! Haha, such fun. But totally different. Very nice look, fresh young! And great shoes! I love the way you styled this outfit. love that tie up top! great look! This is so chic, lady- love the denim mini skirt with those lace-ups! That mini is fabulous and shows off your long legs! Love the top too! Your mini denim skirt is so adorable and I would love to have shoes like those! So gorgeous girl, have an amazing day! The detail on that shirt is stunning!